Oh Look, Its Elephant Art! Looks just like my Pollock Print! So I got a text from my friend with a picture and caption “Elephant Art.” She then said “zoom in on the price–cute but expensive.” Well dammit that got me. Here we go—> Elephant art… Where in the hell do I begin. I first off would like to thank my friend Christie, or Gunth as I call her, for texting me this as it is topic that is often discussed by artists. Next I will smooth down my ruffled feathers and break down what is wrong, bad, and down right felonious about this situation. ONE: Elephants do not make art. They may have a brush and paint handed to them, and they may scribble, color, etc. on a canvas that is placed in front of them but that’s IT. Art is made with intention. That is a critical factor. With out that it is a pile of mud, a string bean, dookie! TWO: selling animal art confuses the general public, who is already perplexed, about what real art is. If Sassy McTrunkers can paint — why the heck would I pay a human to do it… THREE: That art ain’t good. Now I have seen some artists with similar styles (BIG JOKE) but still. FOUR: If you hand said elephant a makeup brush and it marks on peoples faces, is it now a makeup artist? If you set a cat on a piano and it bangs keys do you call it a concerto? It is the same thing. The difference is that the public is informed about music, they seem to know more of what it is. With art they can not discern, because sadly art is not as much in our culture as music. Everyone does not go into museums and galleries. They do not see art every day. FIVE: Elephants work for peanuts– artists work most of the time for free. By the way the elephants 8 x 10 painting was $99 dollars. That’s a lot of dough for a pachyderm. So anyway there is my rant on Elephant “Art.” The art world is crazy enough with human animals– we don’t need four leggeds included under the umbrella! Hahahaha I liked this line ” If you hand said elephant a makeup brush and it marks on peoples faces, is it now a makeup artist? ” The sad part is a lot of people buy it, whether they are into it as “art” or the fact that an elephant “made” it. There are a lot of animal nuts out there! I understand your being upset, but if you haven't realized, art doesn't ever really seem to be about whose making it, and in some cases it doesn't even matter what it is. If it “amazes”, intrigues, confuses, or enlightens a public audience it gets a front row. I'm not saying I don't agree it's silly, but I'm already as it is under the impression that art to most people for the most part is in fact one big joke. I will say though, candidly, that I thought this was (while probably coached) kind of cool:http://www.youtube.com/watch?v=He7Ge7SogrkI guess what I'm saying is not to take this too seriously. the people who take this “seriously” as art also probably think of kid's spin art as art, or paint by numbers as art, etc. As long as they're treating the elephants well, I can't say it bothers me all that much. I'm not against Elephant “ART” / it's not ART but that's ok_sure it's junk but it keeps the Elephant in peanuts. just another Stupid Pet Trick. Fodder and Mudder should realize this in no way degrades art. If one would write down all the (implied) definitions of art, this stuff falls in.The Elephant's art is not the Elephant's art.. It's the trainer's art. So therefore it is human made. Buy it and put it in the guest bath. A great conversation starter that would probably lead to deeper art talk. Now, excuse me, my cat is tapping me on the shoulder.. apparently she just finished a song and wants me to critique it. sooo demanding!! I agree. It is the trainer's art. Whoever gathered the materials and orchestrated the movement of paint onto the canvas is the artist. A more experienced artist could have made better use of that canvas. A Happening can be a work of art that may not even involve a canvas. An artist can put together people, kites, cars, anything you can think of to bring color, movement, sound, shape,all this is art. The person or people who put it together are the artists. Sometimes art is good, sometimes it is not. Sometimes art is pretty, sometimes it is not. It doesn't have to be pretty but it is nice when it is meaningful. Don't be insulted my fellow artists, We can all do better than that elephant trainer! Your response, has something to do with why this is more sophisticated art than you are giving it credit for. You just told us a great deal about who you are reflecting on these pieces of elephant art. Let me propose to you that this is the primary reason for art. To expose you to other humans by causing you to have an opinion and hence allow us to gauge your sophistication. If I was grading you I would give you a D. Objects re-contextualized are art. Your definition of art is quaint and outdated and anyone who seriously collects art would laugh at you. It's funny that you mention Pollack as this is the kind of argument that unsophisticated people made about his work while it was emerging. I've sat for hours at a time in the Pollack room at MOMA looking at his work. It is sophisticated and so are the people who have written about it in a serious way. Art is often said to be good/bad. This is a red herring. Art is either sophisticated or it is less sophisticated. Judging when and if something is sophisticated is the point of judging art. That “judging” tells you something about the person judging. You have told me. a) You have little knowledge of art history.b) You harbor “art fantasies” Warhol would have found highly amusing. Read Popism again (or for the first time!) and also the Philosophy of Andy Warhol. He fought the law and won. c) You're one of the people who wouldn't let Duchamp display Urinal(R.Mutt) at the Armory Show. d) I disagree that this art does not show intention. It clearly does. I collect Ike Morgan and Daniel Johnston. Because they are mentally handicapped, do you suggest that their art is not sophisticated? Ever heard of the the term Art Brut. Dubuffet wrote extensively on it. e) You are a species bigot. Elephants are highly intelligent and we have only begun to decipher their communication systems. f) Money? Try mentioning money around any artists who offer their work at the more sophisticated levels in the art world. See where it gets you. 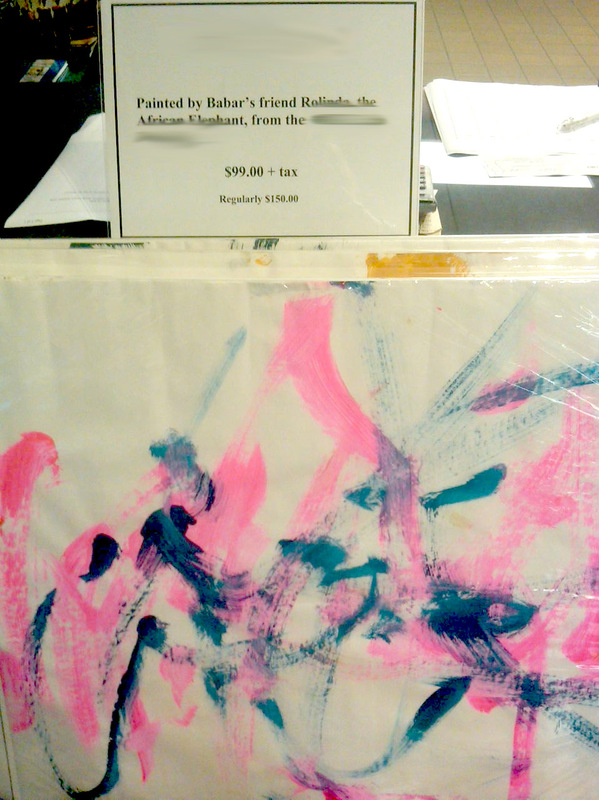 $100 is cheap for a piece of Elephant art. You should invest. I can almost guarantee that it will, with the proper provenance, appreciate in value. That is my opinion as a collector and as someone who works in the gallery world. @Emil. Thanks for the enlightenment. As for art history, I missed the section on Elephants. 2)Just because Warhol wrote something,doesn't make it true or false (For that matter same for me) I am quite fond of Duchamp's readymades– he was a human last I checked. As far as the handicapped art– again, human. Am I a species bigot– perhaps. I don't quite know of the artists that offer their work at a more sophisticated level. I guess I need to be schooled on that one. Also the piece is for sale if you want me to tell you where you can purchase it. Like you said it will probably appreciate! Thank you for the great rant and purposeful discussion. However, when we as artists rant about or feel threatened by “elephant art” I feel we do so because it is hard to get taken seriously for our artistry when a trunk with a brush all of a sudden becomes a point of comparison. 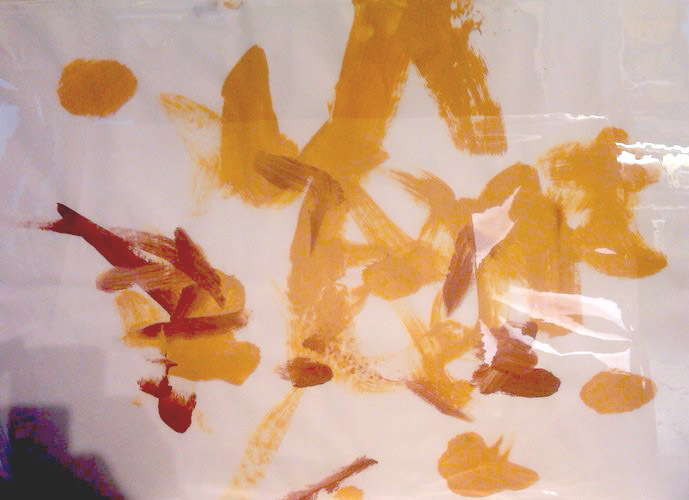 The artistic out put is not significantly different than the fridge drawings or paintings we all have seen from loveable five year olds. This is about the story and the emotions it evokes more than the sophistication of the product. Everybody loves elephants and animal paintings are not new as marketing ploys. It pure context and meant to be fun. Yes as artists we sometimes feel nudged in the wrong direction about our art. Remember it is not the elephant or the art that is being purchased it is the well-packaged story. There are those who would say that Pollock’s art is sophisticated and some say he is a product of good marketing. We should all be so lucky.Enjoy the story, choose not to give it legs and remember you are free to express yourself in many ways. The elephant is chained to a post and the colors are chosen for him. Now where is that pet rock I got as a present a few years ago?. If the comparison is a “trunk with a brush” to a “hand with a brush”, I'd have to say that many of our local artists have grossly disappointed me…I expect more from your intentioned visions…and that may in part explain why many artists feel they are underpaid. I guess, in a way, we're all working for peanuts. You are correct Dev~ I thought it would make for an interesting commentary– mostly in jest– but it has been interesting for sure.